How Long does it take? Approx. 300 up to 450 hours per hectare digging the zai, 150 hours per hectare filling up with manure. 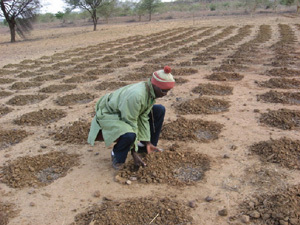 Mali and Burkina Faso's Farmers apply the Zai technique to recover crusted land in semi-arid regions. Zai is a hole, a planting pit with a diameter of 20-40 cm and a depth of 10-20 cm - the dimensions vary according to the type of soil. Pits are dug during the dry season from November until May and the number of Zai pits per hectare varies from 12,000 to 25,000. (The number of zai per hectare and their dimensions determine how much water they harvest. The bigger the number and the smaller their size, the less water they each harvest. )The excavated earth is ridged around the demi-circle to improve the water retention capacity of the pit. After digging the pits, composted organic matter is added at an average, recommended rate of 0.6 kg/pit and, after the first rainfall, the matter is covered with a thin layer of soil and the seeds placed in the middle of the pit. Reactivates biological activities in the soil and eventually leads to an improvement in soil structure. The manure applied to the pits contains seeds of trees or bushes. This helps the regeneration of the vegetation on fields treated with pits. The application of the Zai technique can reportedly increase production by up to 500% if properly executed. The pits should be dug during the dry season. Size and position are important. Composted organic material should be used, not raw organic material. 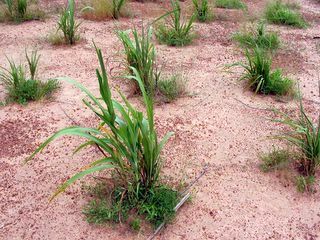 Idea:Porous clay pots and pipes conserve water and enable crops to grow in areas where they otherwise could not grow. With this technology, it becomes possible to save water and irrigate small vegetable gardens in rural areas. Difficulty:The initial labour required to manufacture the pots/pipes and install this technology is very high. The use of clay pots can be more labour intensive than traditional methods of watering crops, and may have difficulty in coping with providing adequate water for crops with high water requirements. Also, the porosity of pots decreases with time, and they have to be replaced at intervals. Pot lifespans are greatly reduced by the use of turbid water with a high silt and clay content. The silt accumulates in the pores, effectively sealing the pipes/pots. Price Range: Since this technology uses clay pots and clay pipes that are locally manufactured, the costs are normally low. The major cost is the cost of labour, which is estimated at approximately $40/ha in Zimbabwe. Geographic Area:This technology is most suitable for dry areas with less than 500 mm rainfall/year. Competencies:Communal farmers, especially women, can manufacture the pots/pipes without having to develop special skills. Pitcher Irrigation or Clay pots irrigation is an inexpensive small-scale irrigation method practiced in the semi-arid state of Karnal, India. The system consists of burying unglazed clay pots in the soil up to their neck. When the pot is filled with water, the natural pores in the pot's walls allow water to spread laterally in the soil, creating the moist conditions necessary for plant growth. Pitchers are filled as needed, maintaining a continuous supply of water directly to the plant root zone. Water is either scarce or expensive. Fields are difficult to level such as under uneven terrain. Water is saline and cannot be normally used in surface methods of irrigation. In remote areas where vegetables are expensive and hard to come by. One of the advantages of using pitchers for irrigation is the result of their water saving capacity. To compare pitcher irrigation to flood or sprinkler irrigation one must correct for the fact that the scales are radically different. Pitcher irrigation is used on small-scale, while flood and sprinkler systems are for more extensive irrigation. Taking this into account, pitcher irrigation is still more efficient. Pitcher irrigation uses water more efficiently than other systems since it delivers water directly to plant root zones, instead of to broader areas of the field. With pitcher irrigation, deep percolation losses are negligible since water is released from smaller areas, and the rate of water loss can be controlled site to site by the amount of water put in each pitcher. Water requirements in a pitcher irrigated field can be even less than those of a drip irrigated system (of the same scale) due to the very low hydraulic conductivity of the pitchers, as well as reduced evaporation losses. Clay pipes irrigation is based on the same principle. Both clay pipes and clay pots can be homemade; most are installed by individual householders. The pipes are joined to form tubes of 250 mm in length with an inside diameter of 75 mm. The pipes are placed along the entire length of the beds by laying them end-to-end in a levelled trench. At one end, a right angle fitting is attached and an upright section of pipe installed. The trench is then backfilled with soil to a depth of 100 to 200 mm, depending upon the soil type. Water is poured into the porous pipe through the upright pipe. Each plant bed is about 3 to 6 m in length. The water seeps into the root zones through the joints between the individual pipes, or through the pipe walls if unglazed clay pipes are used. Alternatively, porous pots (made of unglazed clay) are buried in the soil up to their necks next to the plants or between plant rows at intervals of 300 mm. Water seeps from each pot through the pores and forms a wetted zone. Varying the frequency of filling, the size of the pots and the spacing between pots affects the watering process. Selection of the most suitable size of pot and its placement is governed by the type of crop. Adoption is fairly limited, possibly due to the fact that the initial stages are very labour-intensive. Trials in the dry areas of Chiredzi, Zimbabwe, have shown that communities are interested in this technology. Once the systems are installed, there is very little maintenance required. Operation is quite simple. Farmers, researchers and extension workers must work together to implement this technology. Communities can construct and operate the system. However, government officials and/or NGOs may have to work with pipe/pot manufacturers to ensure availability of supplies of suitable pots and pipes. Extension workers can assist farmers in pipe/pot placement for best effect and at depths/densities best suited for various types of crop. Material for clay pipes and pots, and local skills for pot-making, are readily available at negligible cost. This method provides a uniformly-wetted area, and, because water is applied at depth, often helps to reduce any weed problems - weeds generally have shallow root systems that are not well-served by this technology. Also, pots can be placed next to individual plants. Once the technology is installed the system can be used for several seasons. Effectiveness of the Technology It was found, during the replicated trials, that water savings varied from 11 to 28% of the water used with traditional irrigation. There are a variety of crops that can benefit from pitcher irrigation practices. There currently is not a lot of information available on the internet on the differences in the techniques for each crop. There a few basic differences in technique. As we have shown on our technical page, upright vegetable crops require a 7-10 liter clay pot and 3-6 plants can be grown surrounding each pot. For creeping crops, or vines (i.e. melons, gourds, tomatoes...), the pot size can be 1-2 liters smaller and can be spaced further apart, requiring fewer pots per hectare. tomato> bottle-gourd> bitter-gourd> watermelon> cauliflower. The muskmelon was unprofitable, thus they do not recommend its cultivation with pitcher irrigation. Trees will require larger, deeper pots. Depending on tree spacing and species, one tree may require up to 3-4 pots. Research with pitcher irrigation at the Central Soil Salinity Research Institute (CSSRI) in Karnal India indicates that the amount of water which seeps out of the pots--and thus the number of plants which can be sustained by each pot--depends on the soil type, the porosity of the pot wall as well as the shape of the pot used. Pitchers are generally placed at distances so that wet areas do not overlap. Soil moisture and salt distribution in the plant rootzone are much more favorable with pitcher irrigation than with any surface method of irrigation. Under pitcher irrigation salt accumulates at the soil surface, leaving the salt content of water in the rootzone more favorable than the salinity of water used in the pitcher. Thus even saline water can be used for irrigation in the pitcher irrigation system. Watermelon and muskmelon both tolerated water salinity levels of up to 12 dSm-1. A tomato crop yielded almost 29 t/ha at 12 dSm-1 with 5000 pots/ha. Note that water of good quality for irrigation has a conductivity below 2 dSm-1, while sea water has a conductivity of about 46 dSm-1. Scientists at the Central Soil Salinity Research Institute have found that seven to ten litre pots are sufficient to grow most vegetable crops. The number of pitchers needed per hectare varies with the crop. At least four plants of most vegetable crops could be grown around one pot. A creeping crop such as bitter gourd required 2,000-2500 pitchers per hectare. Upright crops, or crops producing a canopy around the pot required more pots, up to 4,000-5000 pots per hectare. The profitability of pitcher irrigation must consider the labor of acquiring, burying, and filling the pots, in addition to the labor involved in managing the crop. The prospects of pitcher irrigation are reasonably high, especially in areas where water scarcity and salinity limit cultivation. The only difficulty with this method is the high labor demand which it places on the farmer. Pitcher irrigation may be an inappropriate solution where the labor needed to set up and run the system would fall on already overworked laborers. This site has detailed methods for steps involved in setting up a family vegetable garden. Discusses gardening applications in Africa. Also refers to other water-saving irrigation techniques for trees and creeping crops. A newsletter from the Southern African Center for Cooperation in Agricultural and Natural Resources Research and Training on pitcher irrigation implementation in Zambia. Includes methods and results of techniques and practice. Gives background on irrigation used in semi-arid region of India. Discusses benefits of different types of creeping crops. http://upetd.up.ac.za/thesis/available/etd-09062001-093813/unrestricted/08chapter7.pdf Thesis chapter discussing small-farmer irrigation in sub-tropical Africa. Discusses all aspects including how to design pots from raw, local materials to field application. This is a large PDF file and may take some time to download. Table of Contents page listing alternative irrigation techniques including pot and porous capsule irrigation. Implementation of pitcher irrigation in northern Syria. Discusses pitcher irrigation implementation in India and gives general definitions and descriptions of irrigation techniques. We suggest doing a "Ctrl - F" search to find this particular dialouge on the site. See Volume 1 # 1 of the International Ag-Sieve for a brief description of pitcher irrigation in Uruguay. This page was last edited on 6 December 2009, at 18:27.